Odawara Castle (小田原城・Odawara-jo) was likely first constructed by the Omori Clan in the mid-15th century. It was taken over by Hojo Soun in 1495 or 1496 (records vary), and subsequently became the impregnable seat of power for the mighty Hojo Clan. The castle withstood attacks from famed warlords Uesugi Kenshin in 1561 and Takeda Shingen in 1569, but finally fell to the second of Japan's Three Great Unifiers, Toyotomi Hideyoshi, in 1590. The castle didn't fall in battle, however: by 1590, the Hojo were the last clan standing against Toyotomi dominion over all of Japan, so Hideyoshi simply surrounded the Hojo stronghold with 200,000 troops and engaged in a massive party, including his concubine, Yodo-dono, and his tea famed master Sen no Rikyu. After three months, the Hojo surrendered. Odawara Castle was given to Tokugawa retainers when Tokugawa Ieyasu took control of the country following the death of Hideyoshi. The castle was renovated following damage sustained in the Kan'ei Earthquake of 1633, then lost several structures—including the castle tower, or tenshu (天守)—in the Genroku Earthquake of 1703. It was rebuilt once more only to have the tower tilted in the Tenmei Earthquake of 1782, with more structures collapsing in the Kaei Earthquake of 1853. The deadliest event for the castle, however, was a change of government: its tower was demolished in 1870 as the new Meiji government sought to erase symbols of the Tokugawa Shogunate. By 1872 most of the castle was gone, and the remaining stone walls were devastated by the Great Kanto Earthquake in 1923. However, as Japan discovered renewed appreciation for its medieval history, the castle tower was was restored in 1960, with further buildings reconstructed in 1971 and 1997. A major refurbishment was completed in 2016 at a cost of some ¥1 billion (US$8.9 million), making the structures earthquake-resistant and adding an impressive new museum to the tower interior. 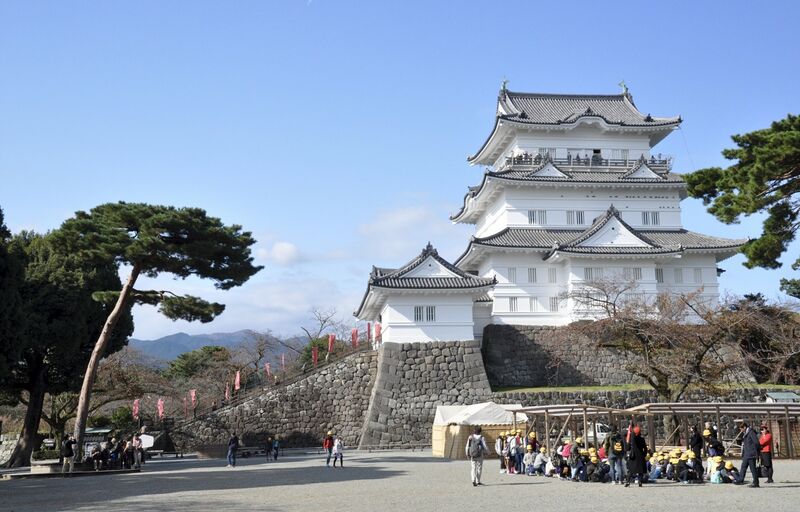 At 27.2 meters (89 ft), Odawara Castle now boasts the seventh-tallest castle keep in Japan (No. 1 is Osaka Castle at 41.5 meters/136 ft). The top of the three-tiered, four-story tower offers an excellent view of Sagami Bay and the city of Odawara. The innermost part of the castle—the main bailey, or honmaru (本丸)—is entered through the Tokiwagi-mon Gate. Reconstructed in 1971, tokiwagi (常磐木) means evergreen, as it was hoped the gate would stand as long as the apparently everlasting evergreen trees that grew nearby. At the base of the steps outside the gate stands an evergreen estimated to be at least 500 years old, now believed to be an important power spot. Within the gate itself you can now find the excellent Tokiwagi-mon Gate Samurai Gallery, featuring an exhibition focused on samurai swords and armor, as well as a fun projection-mapping theater with dynamic images recreating elements of the samurai mythos. For even more samurai action, you can also pay ¥300 to put on a rather satisfying suit of replica armor, though you sadly can't wear it into the castle tower. If you don't feel like being a samurai, ninja and princess options are also available. 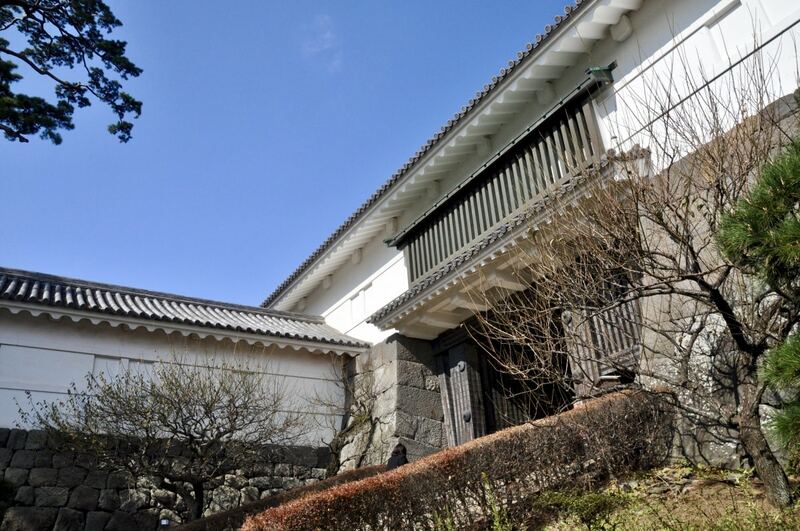 Admission to the castle tower is ¥500, while the Samurai Gallery is ¥200. You can get a combined ticket (recommended!) for ¥600. Odawara Castle is known as a prime spot for cherry blossom viewing in the spring. You can also see plum blossoms in winter, azaleas and wisterias from April to May, irises from May to June, hydrangeas in June, and lotuses from July to August. As an added feature, you can also download a multilingual app that will guide you through much of the castle—particularly helpful in the upper levels of the tower museum, where multilingual signage gets scarce, though English, simplified and traditional Chinese, and Korean are available in some areas. You might notice the Triforce symbol found all over the grounds. This is not an indication of Zelda fandom, however: rather, it's the crest of the Hojo Clan, the Mitsu-uroko (三つ鱗, literally "three scales").